• The global innovative and generic/biosimilar pharmaceutical industries welcome the entry into force of the Medicrime Convention and encourage countries worldwide to sign and ratify it. • The Medicrime Convention will ensure international cooperation between the competent health, police and customs authorities and will help to make real strides globally in fighting counterfeit medicines. • This marks the beginning of a new era in our collective efforts to criminalize the production and distribution of counterfeit medicines and to shine a light on a dangerous business that puts patients at risk. GENEVA, Sep. 30 /CSRwire/ - A unique international tool criminalizing the trade of counterfeit medicines, the Medicrime Convention, will enter into force on 1st January 2016, after 5 countries out of its 24 signatories completed the ratification process. The Medicrime Convention, launched by the Council of Europe in December 2010 is opened for signature by all countries in the world and aims to curb what it defines as counterfeit (falsified) medicines, that is medicines whose identity and/or source have been falsely represented. IFPMA, EFPIA, PhRMA, IGBA, EGA, and GPhA and their members – the global innovative and generic/biosimilar pharmaceutical industries – welcome such a significant development and the role played by the European Directorate for the Quality of Medicines and Healthcare (EDQM) of the Council of Europe. They stand ready to work closely with all those engaged in the fight against fake medicines and share their expertise where they can to help with the implementation and enforcement of Medicrime. “The fight against counterfeit medicines is gaining momentum. Strong legislative frameworks are necessary to combat counterfeit medicines and Medicrime is a unique tool that can curb this problem, said IFPMA’s Director General Eduardo Pisani. “Medicrime introduces criminal sanctions targeting both those who manufacture counterfeit products and who distribute them. Perpetrators involved in the production and traffic of counterfeit medicines are criminals and should be prosecuted as such.” he explained. Counterfeit medicines can have the wrong active ingredients, the wrong dose or dangerous substances and could result in drug resistance, further illness or disability or even death. All medicine categories are affected, be it originators’ or generic, prescription-only or over-the-counter medicines. “Counterfeit medicines, which are mainly linked to organized crime, have considerably grown in recent years, given the high profits and opportunities offered to criminals, including through the spread of e-commerce. Yet, in many countries, the trade of counterfeit medical products is even less sanctioned than selling narcotics for instance and such impunity does come at the detriment of patients’ health”, said EFPIA’s Director General Richard Bergstrom. “Counterfeit medicines are a serious public health threat.” IGBA Chair Jim Keon said. “This international tool can help strengthen the global pharmaceutical supply chain to stop the spread of counterfeit medicines and ultimately protect patients”. Global pharmaceutical associations share the view that there is a global shared responsibility to tackle the issue effectively and promptly. All associations join forces to protect patients, by improving product security through, e.g., the European Medicines Verification System, and by raising awareness about the dangers of counterfeit medicines, as does the Fight the Fakes campaign which gives a voice to the victims and shares the stories of those working to put a stop to this threat to public health. “Counterfeit medicines frustrate the concept of quality of medicines. Where quality is not ensured, patient safety is at risk” said Adrian Van Hoven, EGA Director General. “Fake medicines are a global concern and people in low- and middle-income countries are especially at risk. The proportion of fake medicines is as much as 10% globally, while in some areas of Asia, Africa and Latin America, fake medicines may account for up to 30% of medicines in circulation. In Africa, one-third of all malaria medicines are probably fake. This threat requires a multi-stakeholder and multi-disciplinary collaboration both at local and global levels”, he added. While the entry into force of the Medicrime Convention is a decisive milestone, the fight against counterfeit medicines requires even more widespread support. EFPIA, IFPMA, PhRMA, IGBA, EGA, GPhA and their members encourage other countries worldwide to sign and ratify the Convention. Promotion of national and international cooperation. A wide scope. The Convention concerns all counterfeit medical products, whether IPR-protected or not, generic/biosimilar medicines or not (Article 3) including all medicines, even investigational, medical devices, active substances, excipients, components and accessories. The Convention is not concerned with IP infringements but defines “counterfeit” as products with a “false representation as regards identity and/or source”. Substantive Criminal Law. 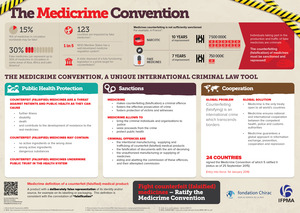 Medicrime establishes as offences, when committed intentionally, the manufacturing of counterfeit medical products (Article 5); supplying, offering to supply and trafficking in counterfeit medical products (Article 6); the falsification of documents (Article 7); ‘similar crimes’ (Article 8); and aiding and abetting the commission of crimes under the Convention (Article 9). It aims to both prevent and combat ‘medicrime’ by providing for sanctions and preventive measures that are ‘effective, proportionate and dissuasive’ (Article 12). Victims are defined broadly and given strong protection under the Convention (Articles 19 and 20), but the Convention is also designed to strengthen public confidence in health authorities and healthcare systems through enhancing and protecting the legal distribution chain. Jurisdiction in Medicrime is established so as to ensure that no criminal acts go unpunished, therefore giving jurisdiction the greatest possible number of states (article 10). Effective Cooperation. Parties must take the necessary measures to ensure exchanges of information and cross-border cooperation between health authorities, customs, police and other competent authorities in the operational management of cases on both national and international levels. IFPMA represents research-based pharmaceutical companies and associations across the globe. The research-based pharmaceutical industry’s 2 million employees research, develop and provide medicines and vaccines that improve the life of patients worldwide. Based in Geneva, IFPMA has official relations with the United Nations and contributes industry expertise to help the global health community find solutions that improve global health. The International Generic and Biosimilar Medicines Association (IGBA) was founded as IGPA (International Generic Pharmaceutical Alliance) in March 1997 to strengthen cooperation between associations representing manufacturers of generic medicines. Its membership includes the EGA (Europe), the CGPA (Canada), the GPhA (USA), the JGPMA (Jordan), the NAPM (South Africa), the TGPA (Taiwan) and the JGA (Japan) while the associations from Australia (GMiA), Brazil (ProGenericos) and Mexico (AMEGI) are Associate Members. The IGBA is at the forefront of stimulating competitiveness and innovation in the pharmaceutical sector by providing high quality pro-competitive medicines to millions of patients around the world. Through its constituent member associations, the IGBA maintains constant dialogue with government authorities (including the European Commission for Europe) as well as with international institutions such as WTO, WIPO and WHO. More information: www.igpagenerics.com. The European Federation of Pharmaceutical Industries and Associations (EFPIA) represents the pharmaceutical industry operating in Europe. Through its direct membership of 33 national associations and 39 leading pharmaceutical companies, EFPIA is the voice on the EU scene of 1,900 companies committed to researching, developing and bringing to patients new medicines that will improve health and the quality of life around the world. EGA represents the European generic, biosimilar and value added medicines industries, which provide high-quality cost-competitive medicines to millions of Europeans. Companies represented within the EGA provide over 160,000 skilled, high value direct jobs in Europe. Generic medicines save EU patients and healthcare systems over €40 billion each year and account for 55% of all dispensed medicines but for only 21% of the pharmaceutical expenditure in Europe. The European generic and biosimilar medicines industries’ vision is to provide sustainable access to high quality medicines for all European patients, based on 5 important pillars: patients, quality, value, sustainability and partnership. For more information please follow EGA at www.egagenerics.com and Twitter @egagenerics and @ebgbiosimilars. GPhA represents the manufacturers and distributors of finished generic pharmaceuticals, manufacturers and distributors of bulk pharmaceutical chemicals, and suppliers of other goods and services to the generic industry. Generic pharmaceuticals fill 86 percent of the prescriptions dispensed in the U.S. but consume just 27 percent of the total drug spending. Additional information is available at www.gphaonline.org. Follow us on twitter: @gpha. Hungary, Spain, Moldova, Ukraine, Guinea. Click here to view a PDF of this release.